The famous folk legend of Johann Faust, an alchemist, astrologer, and magician of the German Renaissance, inspired the play Faust by Johann Wolfgang von Goethe, as well as The Tragical History of the Life and Death of Doctor Faustus by Christopher Marlowe. It’s said that Faust made a deal with Mephistopheles for his soul in return for 24 years of service from this demon. But, all of Faust’s wishes had gone sour in the end. So it is told. One of the most famous alleged pacts was that of Robert Johnson, a well-known Blues musician in the 1930s. It is said that he had little, if any, talent, until he met a mysterious man at a crossroads in Mississippi. Upon his return to his home town a few months later, he had become one the best blues artists of his time. Shortly before his untimely death at the age of 27, Robert Johnson often talked about and wrote songs about being chased by what he called “hell hounds.” Robert Johnson also died under strange circumstances and is buried in an unmarked grave. 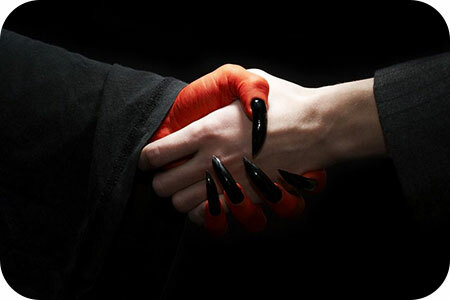 Today, some popular music artists and celebrities openly admit to making deals with devils, in return for fame and fortune. It is believed that the demons that offer these deals are many-sided demagogues. To the psychologist they might say, “I will give you new knowledge and understanding.” To the occultist they might say, ”I will give you the keys to the secrets of creation.” They confront the religionist and the moralist with a mask of integrity, and promise them the help of Heaven. And finally, to the rationalist and the liberalist they might say, “I am not there. I do not even exist.” These entities are skilled strategists. They are masters of every tactic of the spiritual battlefield. I believe these beings are not from Hell. Instead, it is my understanding that they are actually a very dark race of 4th dimensional aliens. They cannot be in this dimension without a 3rd dimensional body. And, for some reason they are stuck in time. Or, in between time and space. They are very ancient and very intelligent beings. When in a body, they are incredibly psychic and telekinetic. These abilities have been documented in hundreds of known possession cases. They are imposters, with impeccable precision and skill, who can imitate precisely any known or unknown being, or deity. And, who can and will deceive to get what they want. So, what happens when one of these beings is summoned? I believe the summoner agrees to allow this entity to inhabit their body, in exchange for the abilities these beings possess – abilities that seem superhuman. Or, voices that sound angelic. Or, abilities to play instruments that would otherwise be impossible. Problem is, when these beings possess a human, they will feed on their soul energy, or life force, until it is gone. The person’s soul will in fact, fade away. Since, these beings are in this shell with a person, they have all of their thoughts and dreams and memories, and are able to mimic them perfectly. Generally, leaving those who don’t know what has taken place, none the wiser. Once, the light body, or soul, of a person is consumed, all that is left is the evil to possess the shell that was once a human being with an immortal soul. The death of the soul occurs during this time. It’s unclear exactly how long it takes for one’s soul to be completely consumed. Sometimes the victims of such possessions have been known to request an exorcism to be performed on them. But, it seems as though this is only a temporary fix. Once, that door is opened, it is incredibly difficult to shut it again. Especially, once the victim finds they can no longer perform with superhuman strength, or talent. And, they find that all the things that made them so special are essentially gone.